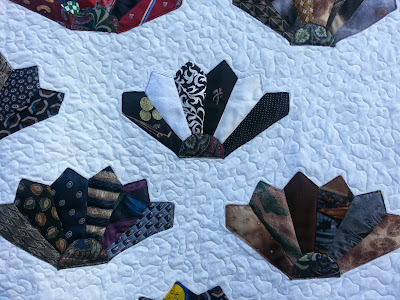 Tie Quilts are another way to preserve and display a loved ones ties. 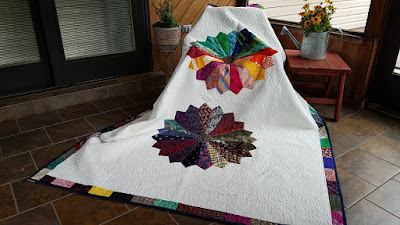 The client loved the first quilt so much, she ordered a second one! 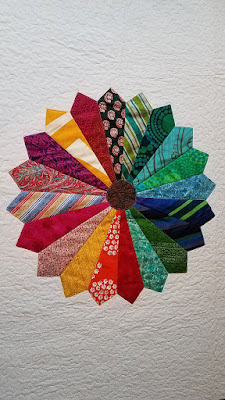 Here is the second tie quilt ordered! It is truly a one-of-a-kind quilt . It has a few more brighter ties in the Dresden Plate! Just love the custom border. Quilt tabs were added to the back for hanging-truly custom! 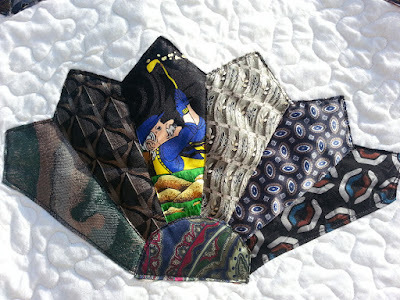 Ties are made of beautiful silk fabric, incorporate them in a quilt and they add such beauty. 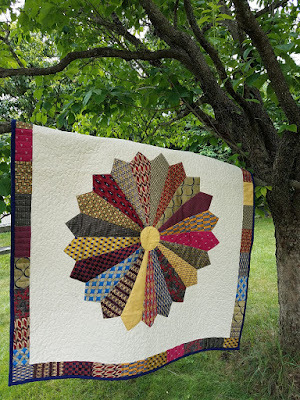 Here is a Modern style lap quilt that has twenty ties in it. the block shown here is made up of 9 ties! Who doesn't love Spider man ? 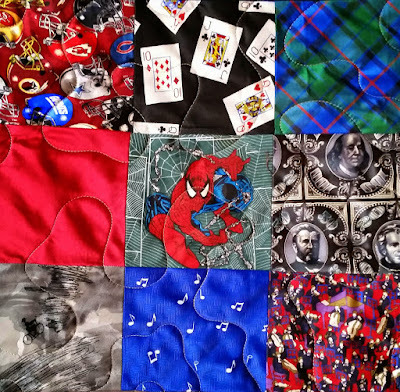 These Custom Tie Quilts are truly Out of this World! 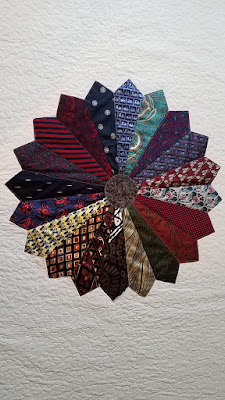 Shown above is a twin size Tie Quilt with two Dresden plates and a a custom tie border. WOW! 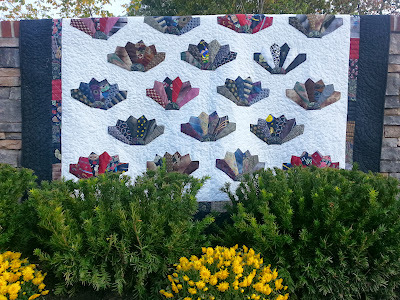 75 Neck ties were used to make this 87" by 87" quilt. and of course a classic border that frames the ties gorgeously. 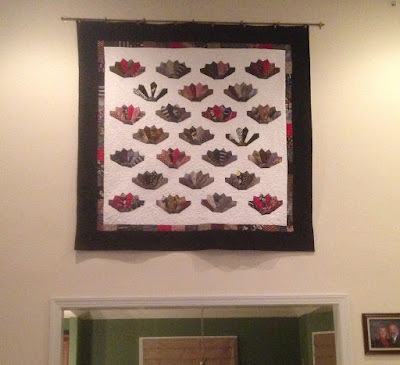 This is how the tie quilt looks hung in my client's home. It truly is a piece of art work! "Thanks for everything Molly. I can't tell you how much each and every quilt means to me and my family. Greg will always be a part of us through them. What a great way to remember him and feel close to him." 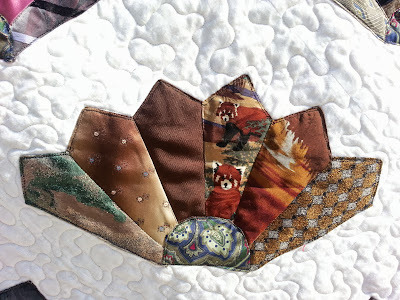 Tie Quilts take an enormous amount of time to make.